One of the key reasons thousands of holiday makers visit the Bay of Plenty region every year is its stunning, golden sand beaches. Hugging the Pacific Coast Highway from Waihi Beach to Ohope Beach, the Eastern Coast of New Zealand’s North Island is blessed with stretches of clean, rolling surf, protected dunes and coastal beauty. Whether you’re a surfer, windsurfer, boogie boarder, swimmer or sunbather, our beaches have something to offer. Kite surfing, yachting, fishing, surfcasting and sea kayaking are just some of the activities going on around the bays. Read more here about offshore Bay of Plenty activities. Most beaches are patrolled in the summer time by members of the Bay of Plenty Surf Life Saving Association and the surf patrol adds its own special magic to the summer atmosphere by holding surf life saving competitions and training on many of the beaches in the region. There are numerous estuaries, bays and picnic spots for families, or those looking for a quieter day in the sunshine. 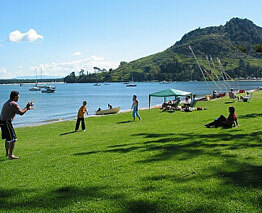 Try restful Pilot Bay, just around the corner from The Anchorage, for a family day out. Lying at the foot of Mount Maunganui, this quiet bay is a great environment for picnics, swimming, windsurfing and kayaking. 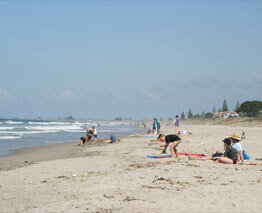 Mount Maunganui is one of the most popular Bay of Plenty beaches. The small town’s population increases many times over at the Christmas and New Year’s break, with revellers flocking to beach side festivals, concerts, surfing, beach volleyball and tri-athlete competitions, along with jet boat racing. 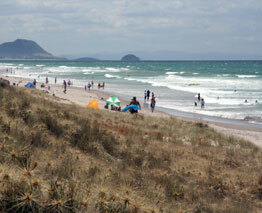 Click here to read more about Mount Maunganui. Papamoa Beach is also very popular; stretching kilometres down the coast, with a view of Mount Maunganui in the far distance. Papamoa Beach is less crowded than the beach at the foot of Mount Maunganui and many surfers congregate at the Domain Road end of this beach. Waihi Beach is a well kept secret. A gorgeous, long stretch of sand and waves, this small beachside town offers stunning coastal walks, great surfing and other water sports opportunities. Ohope Beach is now a popular tourist spot and resort suburb. With a wonderful beach for swimming, Ohope Beach stretches 10 kilometres. Surfing is popular throughout the Bay of Plenty beaches and many visitors have learned to surf for the first time in these waters. 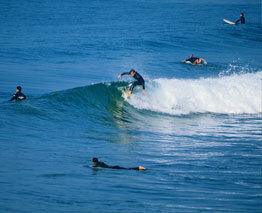 Mount Maunganui and Ohope Beaches offer surf schools for beginners, standard daily classes and individual lessons. For more information, contact Mount Maunganui Surf School, The Lovely Planet Surf School or Kitesurfing New Zealand.